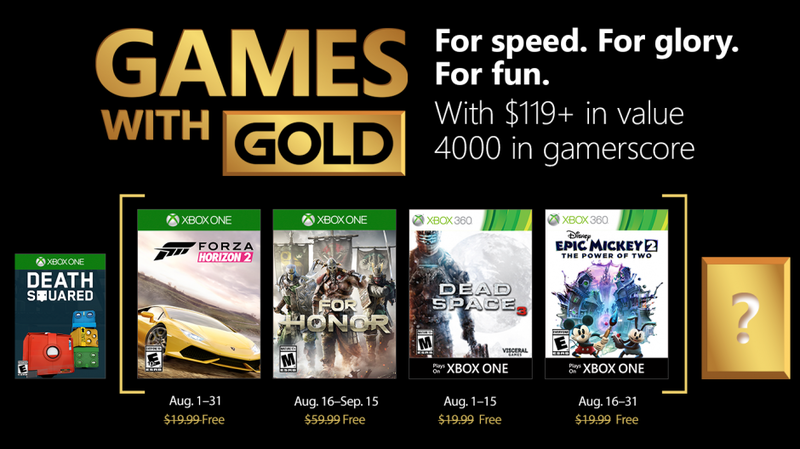 Are the free games being given away via the Xbox Games With Gold scheme for August 2018 any good? Well, depending on your point of view, you will either have found those being gifted for free via Games With Gold over the last couple of months absolute gaming godsends, or utter wastes of time. There is however little chance that the Xbox One and Xbox 360 titles being sent the way of all Xbox Live Gold members throughout August 2018 are anything but the former though. See, August is looking like a cracking month to be an Xbox gamer, with multiple high quality titles arriving for free to allow gamers to get a new fix. In fact, it’s probably the best month for a little while in terms of sheer quality of experience, and no matter whether you are an Xbox One gamer, or still plodding around in the land of Xbox 360, the Games With Gold scheme is delivering the goods. But why? Well, let me tell you exactly why these games should be on your radar. There is no better racing series in gaming than Forza Horizon. There you go, I said it. And I’ll debate the fact forever more that Forza Horizon really is the greatest racing franchise the world has ever seen. Yes, it is that good and the move made to run the Horizon series alongside the standard Motorsport editions was an inspired one, taking us away from the confined tracks to instead be able to explore the huge open worlds of the Horizon festivals. With a huge number of cars to drive, find, unlock and race, Forza Horizon 2 may now be getting on in racing terms, but as a warm up to the upcoming Forza Horizon 4, there is quite possibly no better time than now to stick this stunning racer into the laps of all Xbox gamers via the Games With Gold freebies. If you’ve yet to take in an epic road trip round Southern France and Northern Italy, then make sure you sort that out pronto. It’s been a few days since we heard the initial announcement that For Honor would be included in the Games With Gold program for August, but still I’m sitting here flabbergasted that something so big, and so recent, from one of the biggest publishing teams the world has ever seen, is being stripped of its price tag. But it’s true and For Honor really will soon be free to download. Why should you play it? Well, the answer to that is fairly simple really – because it’s damn great, and if you have ever wanted to get involved in some super intense fighting as a bold Knight, a brutal Viking or the most deadly of Samurai, then For Honor lets you do just that. Whether alone and taking in the stunning story mode, or conquering foes on the online battlefield, For Honor delivers a fighting experience like no other, with one of the best combat systems that is matched by few. Add in the fact that For Honor is getting a huge free update in September and that’s why you should be getting your download in as soon as is humanly possible. Ever crash landed on the frozen planet of Tau Volantis, before going about dismembering various Necromorphs limb by limb? No? Well, you don’t know what you are missing… but thankfully there is no longer an excuse. Dead Space 3 follows on from the free download of Dead Space 2 from a couple of months back to see us dropped into the harsh world of Tau Volantis. From there on out we get the opportunity to be subjected to a stunning tale that sees us dispatching multiple enemies with some of the greatest custom weapons gaming has ever known. Whilst we can put the Kinect commands that were original included in the game to one side (because you know, Kinect and all that), instead we get to focus on exactly what makes the Dead Space series a good one – the death and destruction that Isaac Clarke and John Carver get to dish out… limb by limb. Dead Space 3 isn’t just a tale of survival, it’s an experience that shouldn’t be ignored and even though this native 360 title is seriously getting on in years, even those on Xbox One should be looking forward to playing it. Disney Epic Mickey 2: The Power of Two – Xbox 360 – 16th-31st August 2018 – Consider It! For as famous as Mickey is, in the company he is surrounded by with this month’s Games With Gold titles he doesn’t really stand a chance of shining. And that would be a shame because whilst Epic Mickey 2 isn’t the best game you are ever going to play, it’s certainly not the worst. Fans of Disney or Mickey alike will love what is being told in the Power of Two, with platforming mechanics and cooperative elements taking charge as you take Mickey and Oswald Duck through the wonderful world of Wasteland like never before, all armed with the power of the brush. The art style alone is sure to drag many in, but the power of Mickey is a big one and that should be enough to ensure that Disney Epic Mickey 2: The Power of Two is worth a little look. So, as mentioned at the top of this piece, there are at least three absolute standout titles that you should be begging to get downloaded asap. Whilst Epic Mickey 2 may be the slight runt of the litter, there is no debate over the quality of Forza Horizon 2, For Honor, or Dead Space 3, and that ensures that the Xbox Games With Gold scheme has hardly been in a better place than the one it is in throughout August 2018. Do you agree? What do you think of the free games coming our way through August? Let us know your thoughts in the comments down below.